It's been a while since i did a post. I've been swamped with work... You know the thing you have to do when you are a adult to get the recourses to buy more warhammer and stuff. 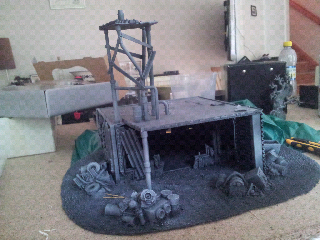 Last time i had a ork period i start on a build of a mekkshop. I got as far as the basic structure. This time i have added some details, some rubble, a base and some sand. Hopefully I'll get started on the paintjobb next week. Now I'm off to my folks. Have a nice weekend. It is taking shape, my friend. I like! That ork world will look da greenest! Makes me whant to play my Orcs!